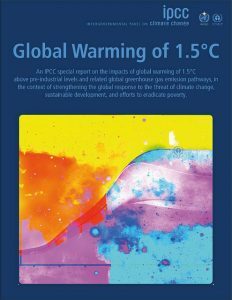 It is it is still possible to keep global temperature from rising more than 1.5 degrees Celsius above pre-industrial values and limit the devastating impacts of climate change, However, this will require a vast, unprecedented global effort according to the latest report from the Intergovernmental Panel on Climate Change (IPCC). National pledges submitted to date through the agreement are not nearly enough to avoid more than 1.5°C of warming, the report noted. Greenhouse gas emissions from human activity, which come mainly from burning fossil fuels(ie coal and oil), would need to be cut roughly in half by 2030 and virtually eliminated by 2050 in order to keep from “overshooting” the 1.5°C target, said the report. That emissions instead increased by 1.4 percent in 2017 raises questions as to how serious governments are in carrying out the commitments made in the 2015 Paris Agreement. The IPCC is the UN body for assessing the science related to climate change. It was established by the United Nations Environment Programme (UN Environment) and the World Meteorological Organization (WMO) in 1988 to provide policymakers with regular scientific assessments concerning climate change, its implications and potential future risks, as well as to put forward adaptation and mitigation strategies. The current report was authored by 90 scientists after reviewing more than 6,000 scientific reports from a range of fields.